Parathyroid tumors located in the chest can almost always be removed via a small neck incision. Don't split your sternum open to remove a parathyroid adenoma in your chest! Parathyroid glands are located in the chest in about 2% of all people. This is not a problem unless this parathyroid gland develops into a tumor (a parathyroid adenoma) causing hyperparathyroidism. When this occurs it must be removed. However, almost all parathyroid adenomas in the chest can be removed through a small incision in the neck. It is almost never necessary to split the chest open (like cardiac surgery) to remove a parathyroid tumor in the chest. Parathyroid anatomy is the most variable anatomy in the human body. Parathyroid glands (and therefore, parathyroid tumors) can be located anywhere from the jaw down to the bottom of the heart (as seen in the picture on the right). This occurs because the 4 parathyroid glands are formed near the base of the brain when we are in our mother's womb, at about 2 months gestation. Shortly thereafter, the parathyroid glands are supposed to migrate down into the neck to end up next to the thyroid gland (remember, "para" means "around", so para-thyroid glands are the "around the thyroid glands"). If a parathyroid gland does not migrate down far enough, it will be high in the neck under the jaw. If a parathyroid gland migrates too far, it will end up in the chest. This blog is about parathyroid tumors that migrated too far and ended up in the chest. A blog published a few weeks ago discusses parathyroid tumors that are located high in the neck under the jaw (undescended parathyroid tumors). Most parathyroid tumors "in the chest" are only an inch or two into the chest. 100% can be removed from a small neck incision. The word "ectopic" is used to describe a parathyroid gland that didn't end up where it was supposed to end up (next to the thyroid gland). Thus ectopic parathyroid glands can be high in the neck (under the jaw), or down in the chest. A very important concept for every patient with hyperparathyroidism to understand is that the primary purpose of getting a sestamibi scan is to make sure you don't have an ectopic parathyroid gland. This is the primary reason we at the Norman Parathyroid Center get sestamibi scans on our patients (and to look at thyroid anatomy for thyroid masses and goiters). You need to understand that scans are not accurate enough to be used to diagnose hyperparathyroidism, the ONLY reason to get a sestamibi scan is to make sure the patient doesn't have an ectopic parathyroid tumor-we don't want to make a "normal" incision low in the neck if the tumor is under the jaw-we will never find it! Similarly, we don't want to make the usual parathyroid surgery incision over the thyroid if the parathyroid tumor is in the chest-we will never reach it! Parathyroid scans are NOT to be used to see who does and does not have hyperparathyroidism (this is decided upon by your blood tests, and not scans). The primary purpose of a sestamibi scan is to make sure you don't have an ectopic parathyroid adenoma (high in neck or down in the chest). Thus, if you have a negative scan, you do not have an ectopic parathyroid tumor and your adenoma is almost always right behind your thyroid. Chest parathyroid removed from neck incision. We LOVE NEGATIVE sestamibi scans, they are some of the easiest, fastest operations! 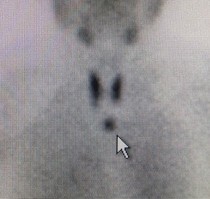 If you understand the concept of ectopic parathyroid glands in the chest, and the similar concept discussed on the blog about ectopic parathyroid glands high in the neck, then you will understand why we do the same operation on everybody regardless of whether they have a positive or negative sestamibi scan (unless it is ectopic!). If the sestamibi scan is negative, then more than 99% of the time it is negative because the parathyroid adenoma is right behind the thyroid and you just can't see it (the thyroid is too big and it hides the small parathyroid adenoma that is behind it). Ectopic parathyroid glands (parathyroid glands in the chest, and parathyroid glands high in the neck) will show in almost every case if the scan is a good quality scan. We operate on 1 or 2 people every week who has an ectopic parathyroid tumor (high in neck or low in chest) that was not appreciated by their first surgeon. They had a lazy, fuzzy, worthless sestamibi scan (typically a SPECT sestamibi scan which is usually very poor quality) that didn't show the tumor. Their surgeon did a "regular" parathyroid exploration and didn't find the tumor (almost always these surgeons will remove normal parathyroid glands… UGH). 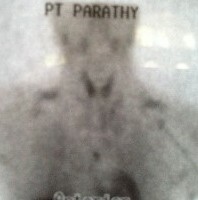 The patient then comes to us (we do about 10-11 re-operations per week) and our scan shows the ectopic parathyroid tumor. Why do you get a sestamibi scan? To make sure you don't have an ectopic parathyroid tumor! If your scan is good quality and negative, then fantastic, you have a routine parathyroid adenoma located where it is supposed to be located-behind the thyroid. Look folks, stop worrying about your negative scans. Stop worrying about scans! Stop getting scans! 95% of parathyroid tumors in the chest can be removed through a small neck incision in less than 20 minutes. We perform over 50 parathyroid operations per week, and since about 2% of people have a parathyroid tumor in their chest, we see it virtually every week. 95% of parathyroid tumors in the chest can be removed from a small neck incision. The vast majority of parathyroid tumors in the chest are only a little bit into the chest like the first scan on this page. 100% of these can be removed from a neck incision. So worrying about having a tumor in your chest is not a good worry. If you want something to worry about, then worry about a parathyroid tumor that is deep in your chest. The deeper (lower) they are, the more difficult they are to remove from a neck incision. The second scan on this page shows a 59 year old man from Boston. 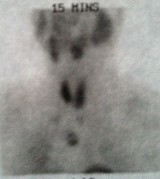 His parathyroid tumor is in his chest, deeper (further down) than the first scan. He had an unsuccessful operation in Boston where the surgeon was not able to remove this tumor through a neck incision. He was scheduled for an "open heart operation" at the Boston hospital where they were going to split his chest open to get the tumor out. His endocrinologist insisted that they consult with us first and we told him that there was a 90% chance we could remove this through a neck incision… even considering that scar tissue would be present from the previous operation. His operation took 19 minutes and we removed this large tumor. The endocrinologist (and the patient!!) was very happy! The deeper (lower) the parathyroid tumor is located (the further it migrated down into the chest during the 2nd-4th month of gestation), the more unlikely that a neck operation will be successful. For this reason, we have "Chest Wednesdays" every third month. On Chest Wednesdays we perform 3 or 4 operations with a cardiac surgeon friend of ours (who has done more than 50 of these with us). These are people that we know can't have a neck incision (most had an unsuccessful operation somewhere else prior to consulting with us). HOWEVER, we do NOT split the chest open down the middle (called a median-sternotomy, also referred to as "open heart surgery incision"). INSTEAD, we make a 3-inch incision between the ribs overlying the tumor and reach under the sternum to remove the tumor. Remember, the parathyroid tumors are always behind the sternum, they are never, never off to the side. These small 3 inch incisions are usually placed so that they are hidden by a woman's bra. The operations usually take less than 45 minutes. We keep these people over night in the hospital, to go home in the morning. This is a MUCH smaller, quicker and safer operation than a median sternotomy! In summary, parathyroid tumors can be in lots of places. If they are up under the jaw or down into the chest we call them "ectopic parathyroid glands". This is NOT a problem, as long as your surgeon recognizes it prior to your operation, and knows anatomy and embryology enough to know how to find these things (without digging around in your neck for a dozen hours!). If you have a good quality scan and it is negative, then fantastic-you don't have an ectopic parathyroid adenoma and your parathyroid tumor is almost always right behind the thyroid where it belongs. Negative scans are a good thing, not a bad thing! Almost all parathyroid tumors in the chest can be removed through a small neck incision, again, provided your surgeon knows how to do it. Less than 5% of chest parathyroid tumors require a "chest" operation to remove it - and almost always a big median-sternotomy (open heart chest splitting) operation is not needed. One final word of caution. We very strongly advise against attempts to remove parathyroid tumors located in the chest through a scope. Another blog talks about this issue in detail. We have 6 people in our practice who will never be cured of severe hyperparathyroidism because their surgeon tried to remove a chest parathyroid gland with a scope. They broke the tumor and pieces of it grew all over their chest cavity and lungs. Some of the worst cases we have ever seen are because of broken chest tumors-broken by surgeons using scopes in the chest. More about parathyroid anatomy and the formation of parathyroid glands (parathyroid embryology) on parathyroid.com. More about ectopic parathyroid glands at Parathyroid.com. More about the potential problems with removing parathyroid tumors in the chest through a scope. Don't do it! Calcium-Pro App for diagnosing hyperparathyroidism (you can't use a scan to diagnose hyperparathyroidism).